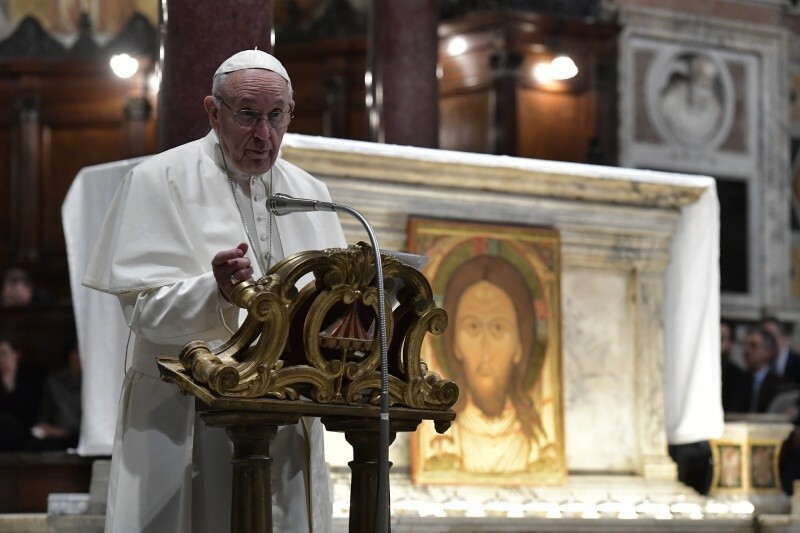 Pope Francis on March 11, 2018, visited Rome’s Community of Sant’Egidio to commemorate the 50th anniversary of the charitable lay association. Zenit published an exclusive interview in the days before the announcement with the president of the community, Marco Impagliazzo. Below is the Vatican-provided full text of his remarks at the event. On this stage, you have written the words of the Psalm: “Your word is lamp to my feet, and a light to my path” (119,105). We have celebrated the coming of the Word of God among us. With this same spirit, you have welcomed what I proposed to every community at the end of the Extraordinary Jubilee of Mercy (cf Ap. Lett. Misericordia et misera, 7). The Word of God has protected you in the past from the temptations of ideology, and today it delivers you from the intimidation of fear. For this reason, I exhort you to love the Bible and spend increasingly more time it. Everyone shall find in it the source of mercy for the poor, and for those who are wounded by life and war. The Word of God is the lamp we look at the future with, even the future of this Community. In his light, we can read the signs of the times. The blessed Paul VI said: “in our eyes, the world is made into a book” (General Audience, 16th April 1969: Teachings VII, 1969, 919). A book to read with the eyes and heart of God. This is the spirituality that springs from the Council, which teaches profound and attentive compassion for the world. It is not only a political or organizational issue. Everyone is called to change his or her heart, acquiring merciful eyes to look at the others, turning into artisans of peace and prophets of mercy. The Samaritan of the parable took care of the half-dead man on the road, because “when he saw him, he was moved with pity” (Lk 10,33). The Samaritan had no specific responsibility towards that wounded man, and he was a foreigner. But he behaved like a brother because his eyes were merciful. Christians, by their very vocation, are brothers and sisters to every person, especially the poor, even though a person may be their enemy. Never say “I have nothing to do with this”. Merciful eyes commit us to living the creative audaciousness of love, and there is so much need of it! We are everyone’s brothers and sisters, and for this reason, we are prophets of a new world; and the Church is a sign of the unity of the human race, among nations, families, and cultures. I wish this anniversary to be a Christian anniversary: not a time to assess results or difficulties; not a time of balances, but a time when our faith is challenged to turn into a new audaciousness for the Gospel. Audaciousness is not the courage of a day, it is the patience of a daily mission in the city and in the world. A mission to patiently weave together again the human fabric of the peripheries that violence and impoverishment have torn apart; a mission to communicate the Gospel through personal friendship; to show how life truly becomes human when it is lived beside the poor; a mission to create a society that considers no one a foreigner. It is the mission to cross borders and walls, to join together. Today, more than ever, carry on audaciously on this path. Carry on standing at the side of the children of the peripheries, with the Schools of Peace that I have visited; carry on being at the side of the elderly: sometimes they are discarded, but to you they are friends. Carry on opening new humanitarian corridors for the refugees of war and hunger. The poor are your treasure! The apostle Paul writes: “So let no one boast about human leaders. For all things are yours […] and you belong to Christ, and Christ belongs to God” (1 Cor 3, 21.23). You belong to Christ! It is the sense that is found in the depths of your history to this day, but above all, it is the key to face the future. Always belong to Christ in prayer, in caring for his little brothers and sisters, in seeking peace, for He is our peace. He will walk with you, he will protect you and guide you! I pray for you, and you pray for me. Thank you.